Boil or steam eggs till cooked, chill and peel. Put both smoked and raw salmon in a food processor, add salt and blend till fish becomes a smooth paste. 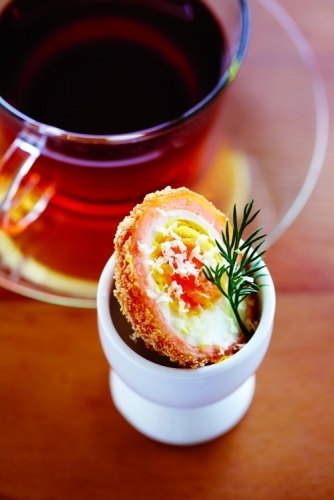 Lightly coat eggs in flour and then wrap a layer of fish mix around each egg, approximately 2mm thick. Then coat into the flour again then drop straight into the beaten egg and finish by covering in bread crumbs. Cook eggs in deep fryer at 180C for one minute or until golden brown. Serve hot or cold, cut into half with fresh horseradish grated on top and salt to season.